Hello, my name is Stan. I’ll be writing John’s blog today, fully clothed, this time from the Carnival Imagination. Last time I wrote John’s blog, things did not quite go as planned. I’ll have a greater challenge writing the blog this time. That is because John is way over in the Caribbean aboard Carnival Dream right now, somewhere between St. Kitts and St. Maarten. I’m here in the Pacific in Ensenada, Mexico. So I can’t bribe, er, talk to Ketut. Jacinta is still learning her new assignment so I don’t want to involve her…yet. I know…I’ll ask Mrs. Heald! Now, Heidi is even farther away than John is so how can I pull this off? And since we have never met, I would have to tread lightly to enlist her as a co-conspirator, I mean, ask for her assistance. My olive branch to Heidi was a gift, a prototype of something called the No Bloke Remote*. Five minutes after I got the delivery confirmation that Heidi received the gift, I received an e-mail from her containing everything I needed to know to post John’s blog. What is a No Bloke Remote*, you ask? Let me explain by offering the following scenario: John is sent to the Fincantieri shipyards in Trieste, Italy, to give us an update on how our new Carnival Vista is coming along. During the week, he gets to go home and spend some time with Heidi and Kye. When he arrives home, he hugs Heidi and Kye, reads Kye a bedtime story, takes Breeze for a walk, does battle with the dishwasher, and plops down in his favorite chair to finally relax and watch a spot of television. Heidi, with a sly smile, hands him the No Bloke Remote*. It looks just like an ordinary television remote control, except it has a special feature. Heidi enters a short code into the remote, a code that husbands will never remember, like an anniversary, and the functions of the remote become scrambled. Entering a channel number increases the volume. Pressing the lower volume button turns the television off. There is no way to figure out what any button will do because the result is completely random. Thoroughly frustrated, John gives up, utters his trademark “Oh, ___” (you know the rest), and hands the remote back to Heidi. Heidi then enters the code again, and, of course, the remote works perfectly. On that note, let’s get to the Q & A, shall we? I hadn’t planned on cruising for at least another couple of years. But then we got a call from Carnival with an offer for past guests that I just couldn’t pass up. A short weekend getaway would be just what the doctor ordered. So here we are with Carnival Cruise Line once again. Our previous Carnival cruise became a reality in much the same way; a call from our PVP (thanks, Valerie!) – actually it was a postcard – promoting the Baltic cruises at a great rate. That Baltic cruise was the trip of a lifetime. I will never forget it. This cruise has a few significant milestones attached to it: Carnival Imagination will follow the very same itinerary as the very first cruise I took 31 years ago. 20 years ago around this time we took our first cruise with Carnival aboard the Festivale. I will be celebrating a very special anniversary with my wife on this sailing. Our CD on Carnival Imagination is Goose. Goose, as it turns out, has been the CD for almost half of my Carnival cruises. Our onboard plans are that we have no plans. The only things I have on my onboard agenda are food-related: try the Mocha Chocolate Getaway (John, why did you have to post that photo on your blog? ), and have Eggs Benedict in the Main Dining Room for breakfast Saturday morning. Usually we have breakfast on Lido deck, even on sea days. I can’t remember the last time we both had breakfast in the Main Dining Room. Since Saturday is a sea day and we both need to relax, I think we’ll head for the Main Dining Room and let Carnival continue to spoil us. Figuring out what to do while in port posed a bit of an issue. I have been to Ensenada a few times before now and wanted to do something different while here this time. I wonder, dear reader of John Heald’s blog, what do you do when you are at a port you have visited many times? Do you visit the same restaurant or bar or beach each time? Do you take the same excursion? Or do you try something new? We ended up planning a fish taco tasting tour. Legend has it that the fish taco was born right here in Ensenada. What better place, then, to do such a tour? Starting off the tour was a visit to La Bufadora via the La Bufadora Adventure shore excursion. I first was introduced to the market at La Bufadora in 2009. Back then, a storm brewing in the Pacific forced an itinerary change on our Mexican Riviera cruise and we ended up in Ensenada instead of Puerto Vallarta. It was on the Bufadora Kayak shore excursion that our guide stopped at the open air market on the way back to the ship and told us to try the fish tacos next to the parking area. So we wanted to try the tacos again and put them to the test. The place is called Lidia’s. Vendors were offering samples of churros hot off the fryer as we walked down the market. Of the half dozen or so samples we tried along the way, we found the best churros at the last vendor on the right, at the bottom of Restaurant Blanquita, right before you reach the blow hole itself. They were even better than the ones we tried in 2009, which until today we thought were the best we had ever had. At the end of the tour, we elected to be dropped off downtown where we went in search of a place called La Guerrerense. La Guerrerense popped up on an Internet search for fish tacos in Ensenada. It is near the dock so I decided to include it as part of the tour. When we found it, we were disappointed to learn that they only make tostadas and ceviche. No fish tacos. So off we went a couple of blocks up and decided to try a restaurant called Mariscos Playa Azul. Our final stop on our fish taco tasting tour was a small stand simply called Fish Tacos Ensenada, or Tacos de Pescado de Ensenada. Fish Tacos Ensenada was listed by the Street Gourmet LA blog as the number one fish taco in Ensenada. We’ll soon see if we agree with that claim. How did each taste? Which place makes the best fish tacos? You’ll have to wait until I can write the review. From Fish Tacos Ensenada, it was a casual stroll past the shops and stores back to the ship. But we couldn’t leave Ensenada without a stop at Hussong’s for nostalgia…and a taste of their margaritas. Supposedly the margarita was invented at Hussong’s. I wanted to go straight to the source and try the original. 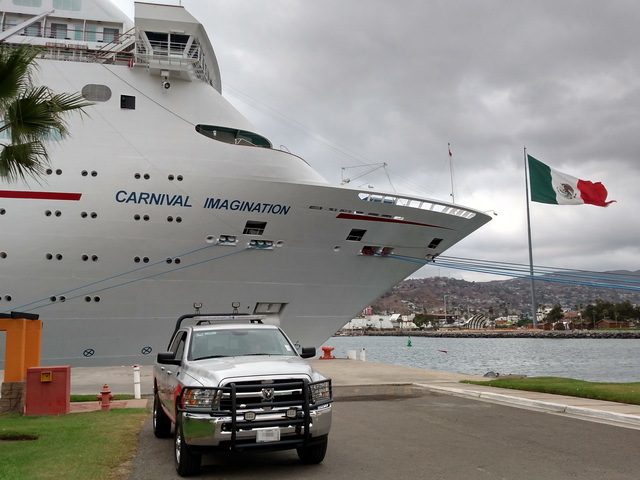 Each of my cruises to Ensenada has provided fond memories. The very first one may not count: we had to anchor off the coast because high winds damaged the only tug boat they had in port – this was before modern ship thrusters were invented – so we couldn’t get off the ship. I learned firsthand that even cruise ships aren’t immune to Mother Nature, thus don’t always make it to their intended destinations. On the second trip I visited Hussong’s and Papas & Beer. As a young twenty-something, I thought I had found the world’s greatest party. My fourth visit found me off the beaten tourist path at Haliotis, a restaurant highly recommended by locals. A friend that cruised with me then showed me the best place in Ensenada to buy leather goods. Also on that fourth visit, I got to spend a few minutes talking about my beloved Jamaica with one of the ship’s crewmembers during his break. I enjoyed seeing how his face lit up when we started talking about his homeland. Onboard again, we attended comedy shows on 2 of the 3 nights, (we were too exhausted the first night,) and the Playlist Production show “Divas”. I have to admit that some of the dancing in that show may have been too much for a PG rating. Now it’s time for some of those frequently discussed topics from John’s blog. In the Main Dining Room for dinner, our staff treated us very well, always smiling and happy to interact with us. Some guests frequently complain on John’s blog and on his Facebook page about the waiters dancing. I must say I completely disagree. Guests really enjoy the dancing on all of the cruises I’ve been on, many times joining in with the waiters. And the waiters themselves looked happy. A few of them were really getting into it, which made the guests get into it. At the end of the performance, the entire dining room burst into applause. And here’s another hot topic here on John’s blog. Yes, that would be the dress code in the MDR, especially on Elegant Night. On our Elegant Night, I saw several men in T-shirts, one in shorts, and a kid in flip-flops. That was just in our corner of the MDR. It didn’t affect my dining experience, but I wonder why people do not dress for the occasion. I know that some men do not even own collared shirts, dress shoes, slacks, or even a tie. Should they not be allowed in the MDR for elegant night? Others may just not want to dress up. One thing that does bother me, and has for the past several years, is when a guy goes out with his date/girlfriend/wife, the lady is always dressed up while the guy looks like a slob. I saw this a lot onboard this cruise. (Kudos, women, for looking nice when dining out). But that’s not just on the ships; it’s on land, too. Cabin door slamming is indeed a problem. On the second night of the cruise, I was sleeping extremely well…until around 2:30 am. That’s when some of the younger party animals returned to their cabins. You could hear them from way down the corridor. And then the door slamming started. Maybe the CDs should consider making an announcement to remind people to be quiet when returning to their cabin. It may not completely eliminate the loud talking or slammed doors but it will reduce it. Ship-specific pins. In three words: Bring them back! Or at least let guests order them online through the Carnival store. It would be nice to have them sent directly to the ship for guests to find in their cabins on embarkation day, but if that is not feasible, mailing them would be good, too. Besides, I need to add to my collection. Another topic that has come up a couple of times on John’s blog is the jogging track. Since I am writing the blog today, I thought I would add my thoughts. On every Carnival cruise I have been on, I have seen people walking around the track in the wrong direction against the flow of traffic, people stopping on the track itself stretching, taking selfies, talking, which causes a backup (and inflamed tempers), and people walking two or three abreast, making it difficult for joggers to get around them. I had to dodge a few myself. I would suggest that there be certain hours that the track can be used: 6:00am to 8:00am for joggers only. After that, open it to walkers and joggers. Post a couple of signs indicating the flow of traffic around the track. There’s currently only one sign up there now. I would suggest at least 4 big red arrows on the wall surrounding the radar dome: forward, aft, port, and starboard. Also post signs that there is absolutely no stopping on the track between the hours of 6:00am and 6:00pm. After 6:00pm, stop, talk, roll around, photograph the sunset, whatever you want to do. Have any of you had experience with the wake-up call system? We arrived (quietly) back in our cabin after midnight on the final night of the cruise. We wanted to set up a wake-up call for 6:00am to be ready in time for debarkation. The automated system confirmed a wake-up call for “tomorrow at 6:00 am”. I wanted the call for this morning, not tomorrow morning. Wonder if the next guest in that cabin was awakened by that phone call. I suggest clearing the system at debarkation. And maybe switching to a new system that will allow you to set a same-day wake-up call. Last, but not least, pizza. To be honest, I didn’t expect much. How good could pizza made on a ship be? But when we tried it, we found we actually liked it! We ended up stopping by the pizza station each day of the cruise. And we weren’t the only ones. Every time we went there, there was a line. I could get used to writing John’s blog. If I could just convince the beards to sign me to a two-year contract – one ship a month for each of Carnival’s 24 ships. Hmmm. Works out nicely, don’t you think? * = There is no such gadget as the No Bloke Remote. I just made it up for the blog. This entry was posted on Monday, 2 November 2015, at 7:50am GMT-0800 and is filed under Blog, Travel with tags Carnival, Carnival Imagination, john heald, Kanale Speaks. You can follow any responses to this entry through the RSS 2.0 feed. You can leave a response, or trackback from your own site. Hello and thank you for reading my blog. I appreciate you taking the time to comment on the post. Getting feedback from a reader’s point of view is important. I will keep your comment in mind for future posts. Thanks again and best of luck to you!